Reception is the first step in the processing of sensation and is dependent on the receptor type, stimulus, and receptive field. Reception is the process of activating a sensory receptor by a stimuli. Sensory transduction is the process of converting that sensory signal to an electrical signal in the sensory neuron. The process of reception is dependent on the stimuli itself, the type of receptor, receptor specificity, and the receptive field, which can vary depending on the receptor type. In more advanced animals, the senses are constantly at work, making the animal aware of stimuli, such as light or sound or the presence of a chemical substance in the external environment, while monitoring information about the organism’s internal environment. All bilaterally symmetric animals have a sensory system. The development of any species ‘ sensory system has been driven by natural selection; thus, sensory systems differ among species according to the demands of their environments. For example, the shark, unlike most fish predators, is electrosensitive (i.e., sensitive to electrical fields produced by other animals in its environment). While it is helpful to this underwater predator, electrosensitivity is a sense not found in most land animals. Senses provide information about the body and its environment. Humans have five special senses: olfaction (smell), gustation (taste), equilibrium (balance and body position), vision, and hearing. Additionally, we possess general senses, also called somatosensation, which respond to stimuli like temperature, pain, pressure, and vibration. Vestibular sensation, which is an organism’s sense of spatial orientation and balance, proprioception (position of bones, joints, and muscles), and the sense of limb position that is used to track kinesthesia (limb movement) are part of somatosensation. Although the sensory systems associated with these senses are very different, all share a common function: to convert a stimulus (light, sound, or the position of the body) into an electrical signal in the nervous system. This process is called sensory transduction. There are two broad types of cellular systems that perform sensory transduction. In one, a neuron works with a sensory receptor, a cell, or cell process that is specialized to engage with and detect a specific stimulus. Stimulation of the sensory receptor activates the associated afferent neuron, which carries information about the stimulus to the central nervous system. In the second type of sensory transduction, a sensory nerve ending responds to a stimulus in the internal or external environment; this neuron constitutes the sensory receptor. Free nerve endings can be stimulated by several different stimuli, thus showing little receptor specificity. For example, pain receptors in your gums and teeth may be stimulated by temperature changes, chemical stimulation, or pressure. The first step in sensation is reception: the activation of sensory receptors by stimuli such as mechanical stimuli (being bent or squished, for example), chemicals, or temperature. The receptor can then respond to the stimuli. The region in space in which a given sensory receptor can respond to a stimulus, be it far away or in contact with the body, is that receptor’s receptive field. Think for a moment about the differences in receptive fields for the different senses. For the sense of touch, a stimulus must come into contact with body. For the sense of hearing, a stimulus can be a moderate distance away. For vision, a stimulus can be very far away; for example, the visual system perceives light from stars at enormous distances. Visual sensory system: This scheme shows the flow of information from the eyes to the central connections of the optic nerves and optic tracts, to the visual cortex. Area V1 is the region of the brain which is engaged in vision. Transduction is the process that converts a sensory signal to an electrical signal to be processed in a specialized area in the brain. Sensory signals are converted to electrical signals via depolarization of sensory neuron membranes upon stimulus of the receptor, which causes opening of gated ion channels that cause the membrane potential to reach its threshold. The receptor potentials are classified as graded potentials; the magnitude of these potentials is dependent on the strength of the stimulus. The sensory system shows receptor specificity; although stimuli can be combined in processing regions of the brain, a specific receptor will only be activated by its specific stimulus. The brain contains specific processing regions (such as the somatosensory, visual, and auditory regions) that are dedicated to processing the information which has previously passed through the thalamus, the ‘clearinghouse and relay station’ for both sensory and motor signals. The four major components of encoding and transmitting sensory information include: the type of stimulus, the stimulus location within the receptive field, the duration, and the intensity of the stimulus. The most fundamental function of a sensory system is the translation of a sensory signal to an electrical signal in the nervous system. This takes place at the sensory receptor. The change in electrical potential that is produced is called the receptor potential. How is sensory input, such as pressure on the skin, changed to a receptor potential? As an example, a type of receptor called a mechanoreceptor possesses specialized membranes that respond to pressure. Disturbance of these dendrites by compressing them or bending them opens gated ion channels in the plasma membrane of the sensory neuron, changing its electrical potential. In the nervous system, a positive change of a neuron’s electrical potential (also called the membrane potential), depolarizes the neuron. Receptor potentials are graded potentials: the magnitude of these graded (receptor) potentials varies with the strength of the stimulus. If the magnitude of depolarization is sufficient (that is, if membrane potential reaches a threshold), the neuron will fire an action potential. In most cases, the correct stimulus impinging on a sensory receptor will drive membrane potential in a positive direction, although for some receptors, such as those in the visual system, this is not always the case. Mechanoreceptor activation: (a) Mechanosensitive ion channels are gated ion channels that respond to mechanical deformation of the plasma membrane. A mechanosensitive channel is connected to the plasma membrane and the cytoskeleton by hair-like tethers. When pressure causes the extracellular matrix to move, the channel opens, allowing ions to enter or exit the cell. 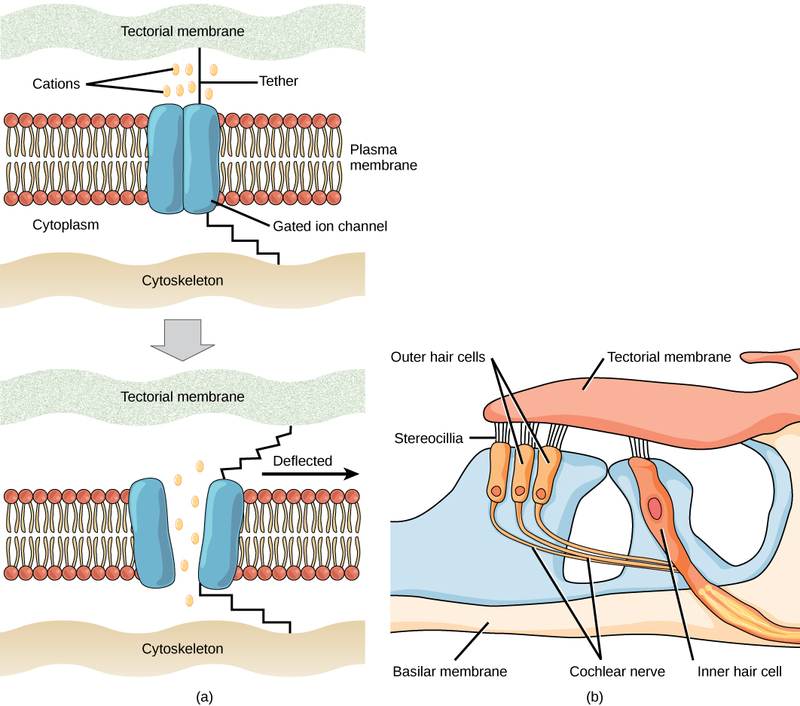 (b) Stereocilia in the human ear are connected to mechanosensitive ion channels. When a sound causes the stereocilia to move, mechanosensitive ion channels transduce the signal to the cochlear nerve. Sensory receptors for the various senses work differently from each other. They are specialized according to the type of stimulus they sense; thus, they have receptor specificity. For example, touch receptors, light receptors, and sound receptors are each activated by different stimuli. Touch receptors are not sensitive to light or sound; they are sensitive only to touch or pressure. However, stimuli may be combined at higher levels in the brain, as happens with olfaction, contributing to our sense of taste. Four aspects of sensory information are encoded by sensory systems: the type of stimulus, the location of the stimulus in the receptive field, the duration of the stimulus, and the relative intensity of the stimulus. Thus, action potentials transmitted over a sensory receptor’s afferent axons encode one type of stimulus. This segregation of the senses is preserved in other sensory circuits. For example, auditory receptors transmit signals over their own dedicated system. The electrical activity in the axons of the auditory receptors will be interpreted by the brain as an auditory stimulus: a sound. The intensity of a stimulus is often encoded in the rate of action potentials produced by the sensory receptor. Thus, an intense stimulus will produce a more rapid train of action potentials. Reducing the stimulus will likewise slow the rate of production of action potentials. A second way in which intensity is encoded is by the number of receptors activated. An intense stimulus might initiate action potentials in a large number of adjacent receptors, while a less intense stimulus might stimulate fewer receptors. Integration of sensory information begins as soon as the information is received in the central nervous system. Perception is an individual’s interpretation of a sensation. Although perception relies on the activation of sensory receptors, perception happens, not at the level of the sensory receptor, but at the brain level. The brain distinguishes sensory stimuli through a sensory pathway: action potentials from sensory receptors travel along neurons that are dedicated to a particular stimulus. 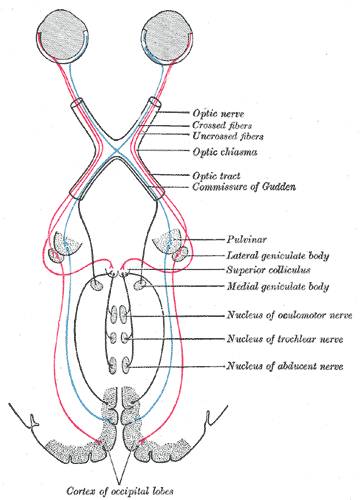 All sensory signals, except those from the olfactory system, are transmitted though the central nervous system: they are routed to the thalamus and to the appropriate region of the cortex. The thalamus is a structure in the forebrain that serves as a clearinghouse and relay station for sensory (as well as motor) signals. When the sensory signal exits the thalamus, it is conducted to the specific area of the cortex dedicated to processing that particular sense. Sensation processing: The brain has dedicated areas to the processing of stimuli, including: (a) thalamus and (b) the auditory, visual and somatosensory processing regions.